Conditions couldn't be worse. The air is dead, not a leaf stirring on the trees lining the dusty Mexican highway. Farmers are burning grapevines, garbage and weeds. Acrid smoke billows upward, then settles like a grimy blanket across miles of hills. Exhausted after driving since 2 a.m. from suburban Irvine to this northern Baja stretch, UC Irvine atmospheric chemist Tai Chen '87, Ph.D. '96 takes a midmorning break at a roadside motel. He knows from long experience that winds may pick up later and improve his chances. After a nap, he's back out, jostling his red Jeep along a rutted cutoff that can't properly be called a road. He clears a rise and gazes at the vast azure Pacific, the tiny fishing village of Punta Baja below. An ocean breeze blows straight at him when he finally steps out onto a rocky promontory. Maybe it will work. He begins to unload his equipment. For decades, UC Irvine scientists from the Blake-Rowland laboratory, headed by atmospheric chemist Donald Blake, Ph.D. '84, have chased down the world's cleanest air. Every three months, like clockwork, they go to Alaska, the southernmost tip of New Zealand and numerous points between, all to capture a minute's worth of air in each of 80 stubby metal canisters. They walk, hitchhike, drive, fly and clamber to the literal edges of the Earth, peninsulas jutting into open ocean or windswept islands – wherever the air will be free of local pollution. The samples are brought back to the basement of Rowland Hall and broken down via sophisticated chromatographs into trace amounts of dozens of gases, which are painstakingly recorded. They become part of the longest continual measurement of multiple air contaminants at mobile sites on the planet, offering a crucial baseline from which to observe global trends and unhealthy spikes of regional contaminants. The data have been used for scores of air pollution and climate change studies, including by the World Meteorological Organization and the United Nations' Intergovernmental Panel on Climate Change. Long-term data are required to understand the big picture. Climate changes over decadal time scales, so it requires observations over the same time scale," says NASA's upper atmosphere research program manager, Ken Jucks. "It's critical for understanding whether our science is correct and whether policy changes are correct." There are other longitudinal experiments – for example, one at a Hawaiian site that primarily measures carbon and another involving stationary monitors in various countries. The beauty of the UC Irvine effort, many say, is that data collection can be adjusted to avoid local pollution that would obscure global trends. Members of the Blake team have driven across New Zealand when the winds are blowing the wrong way, just to grab the cleanest air possible. Jucks credits Blake, a UC Irvine Distinguished Professor of chemistry, for orchestrating the time-consuming project. "Don is a unique guy. 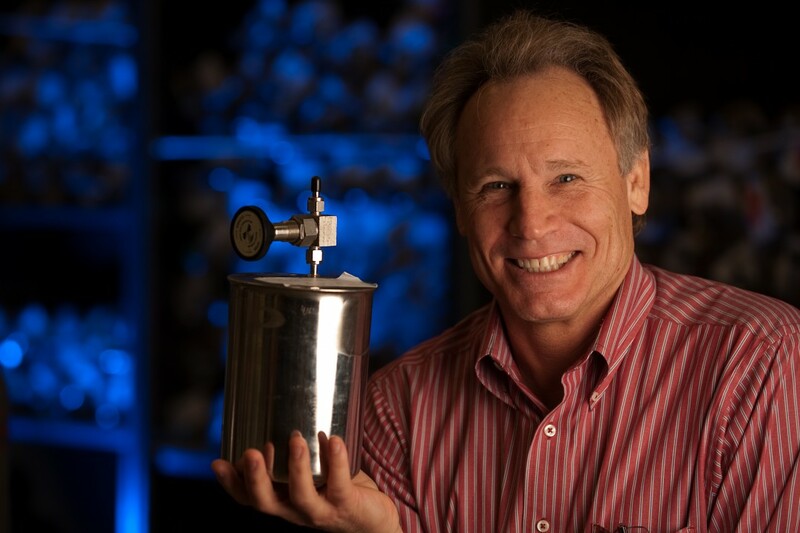 He's somebody that everybody in the science community knows and likes to work with," Jucks says of Blake, who recently received the American Chemical Society's 2013 Award for Creative Advances in Environmental Science & Technology. "He has a sense of humor, he knows his science, and he's a very likeable person who always sees the big picture. If it helps to advance the science, Don is always willing. When you do something like long-term measurement, most of the payoff comes from work that others are doing with your data." NASA provides about $220,000 annually for Spartan travel costs and graduate student stipends related to the testing, which is an ongoing snarl of logistics for Blake and his staff, interrupting their regular studies and lives. They tried to quit about a decade ago, when the researcher who loved it most, Murray McEachern, died. But Jucks' predecessor at NASA wouldn't let them. Blake is typically unassuming when asked about the project. "It apparently is continuing to produce data for many scientists at this critical time on our planet, so we keep doing it," he says. "The experiment is also a labor of love, a living tribute to Sherry [F. Sherwood Rowland]. It's pretty much a rite of passage at the Blake-Rowland lab." That rite of passage began in 1978, when now-deceased UC Irvine Nobel laureate Rowland and Blake noticed that methane concentrations had changed markedly over 18 months at a single South American location. They decided they needed to keep an eye on this and other key gases around the world. They went to various sites sporadically until 1983, when NASA began funding the work. For 30 years straight, lab members have been traveling the length of the Pacific Rim across the four seasons, from 71 degrees north to 47 degrees south latitude. "It's so important to have this long-term data, to be able to pull something back from 25 years ago and see what's changed now," says Isobel Simpson, a senior researcher with the Blake-Rowland lab who analyzes the data and writes scholarly papers on her findings. Post-9/11 security concerns and international unrest have created additional travel and bureaucratic hurdles. But Blake's team still keeps going. The first time Chen made the trip was in 1986. He was 21, spoke no Spanish and was scared. His assignment was Baja, the same trip he makes this time. He got so lost that kindly locals took pity on him and led him to the spot they thought he was seeking. He collected his samples and climbed back in his car. Sometime after midnight, before reaching the border, a man claiming to be a police officer pulled him over. Chen was terrified. He tentatively held out his wallet with his ID. "He said if I gave him the $50 I had, it would cover the fine," Chen recalls. He handed over every dollar he had and drove back to Irvine that night. Now 47, he's amused to hear newer lab members telling the story, unaware that the hapless scientist was him. As with many such tales, the details have become exaggerated over time, with the "fine" now up to several hundred dollars. The work's reach also has grown over the decades. A leading French scientist will soon release research relying on the data. Closer to home, two UC Irvine teams published a pair of papers last year proposing different reasons why the alarming rise in methane levels at the end of the 20th century had slowed: modifications in either fossil fuel use or rice farming practices. The question isn't academic – methane is a potent greenhouse gas that contributes to atmospheric climate change. Both papers cited work by the Blake-Rowland lab. But the fossil fuels hypothesis now seems more likely. Blake's own team members confirmed this by poring over their long-term measurements not just of methane but of a lesser-known cousin, ethane, which is a by-product of fossil fuels but not agriculture. On this trip, Chen easily makes it past the giant new immigration checkpoint in Tijuana. At dawn, he sees the waning crescent moon above Ensenada, with Venus nearby. To his tired eyes, the sky looks like a boy winking at him. A good omen. He clears four military checkpoints – "just bored kids with machine guns" – and chats with mussel fishermen in Punta Baja. By the time he has unloaded his equipment, it's 3:30 and the sun is sinking. He has a limited window in which he must get the air. Tomorrow he needs to be in a latitude to the north. Chen checks the connection on a canister. He swings his arm in an arc, reaching as high as he can, and opens the valve to the sky.